When did we become what we, on our worst days, seem to be? This nation trampled by poor compromise and misplaced screech, this drowning swell of hyper-caffeinated opinion, this landscape of the random and the ruined. We are increasingly disinclined toward rational debate. We rage about the inconsequential. We want to be heard, but we don't want to listen. We're quick to deplore the mess we're in, and tragically ill-equipped to fix it. Impotence has never been my thing. I believe in the kids I teach, the small heroics of neighbors, quantum generosity, anonymous kindness, in doing something, making something, being something. I believe in the idea of what lies ahead, what takes us forward. We are. We can. Thank you for a wonderful article about The Woodlands. After many visits to The Woodlands Mansion and garden cemetery in the 1990s, I was thrilled to read Crowns & Confidences by Samuel Hughes in the November/December 1999 Pennsylvania Gazette issue and learning about another historical figure in repose at The Woodlands, Dr. Thomas Evans, dentist to Louis Napoleon III and European and Russian royalty, whose bequest to the University of Pennsylvania built the Penn Dental School. The Evans obelisk is the tallest monument in The Woodlands and is visible from 34th Street and Baltimore Avenue. Beth - a great article this morning. 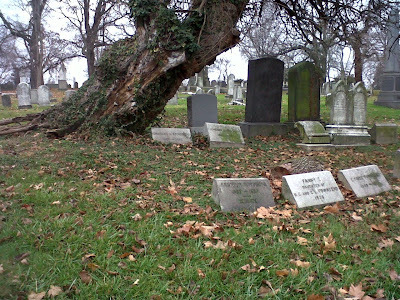 I do what you do only in another West Philly place - Old Cathedral Cemetery (48th/Lancaster). Our parishes, Our Mother of Sorrows/ St Ignatius even has an annual Mass in the cemetery. Folks Dont remember that historically they were places to hold picnics and family outings. A heartfelt thank you to Teri Brown, John, and Bernadine for your words. We don't know, as writers, if our words reach unless we are told. Thank you for telling me. This piece meant a lot to me. I used to live very near there. I never entered, because the gates had threatening signs about guard dogs, which gave me the impression that the place wasn't open to the public. In the city, you look for any patch of greenery, and I used to look in and wonder what the grounds were like, and who was buried there. Thank you for the view, and also for the apt phrase "misplaced screech!" Another place to visit!! Thanks for sharing this wonderful article and historical spot with us, Beth!! Beth, What a beautiful piece of writing. I have long loved The Woodlands and took my kids there when we moved to West Philadelphia 28 years ago. My son takes his daughter through the cemetery to introduce her to the richness of of our city's past. Her photo appears just above your essay in today's Inquirer. I don't know if you would call that irony, but it is certainly kismet.